Add all of the chimichurri ingredients to a small bowl or jar, stir well to combine. You can also add all of the ingredients to a personal blender and pulse until chopped and combined. (If you use the blender, skip chopping the parsley.) Refrigerate the chimichurri for at least one hour to allow the flavors to come together. Let the chimichurri to come to room temperature before serving. Refrigerate any unused portion, the chimichurri will keep in the refrigerator for a few days. Add all of the marinade ingredients to a small bowl. Stir well to combine. 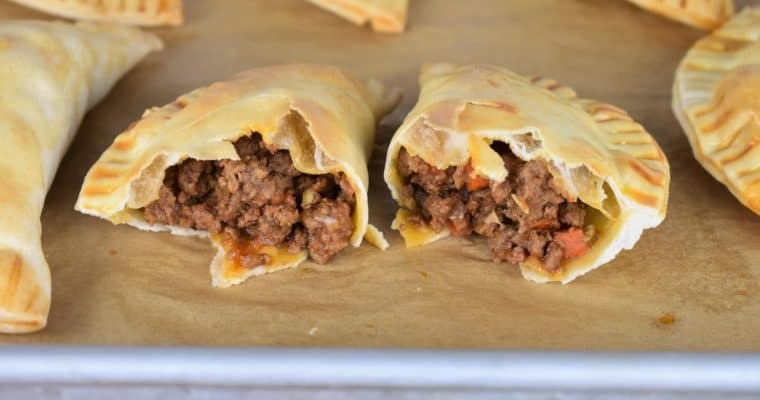 Add the prepared marinade and the beef to a zip-top bag. Remove the air and seal tight. Massage the meat to coat well with the seasoning. Refrigerate for at least an hour. Add the potatoes to a medium saucepan and cover with water by a couple of inches. Bring the water to a boil. Add 2 tsp. of salt. Cook the potatoes for approximately 10 minutes. They should be tender, but not fall-apart tender. If they are too soft, they’ll break apart when skewered. Drain completely and let the potatoes cool a bit so they can be handled. Thread the beef and potatoes on the skewers alternating ingredients. Spray the BBQ grates with the grill spray to prevent sticking. 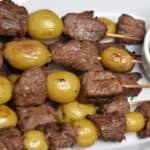 Grill the beef & potato skewers on moderate-low to low heat for approximately 15-20 minutes until the meat is cooked. Turn the skewers about half-way through. 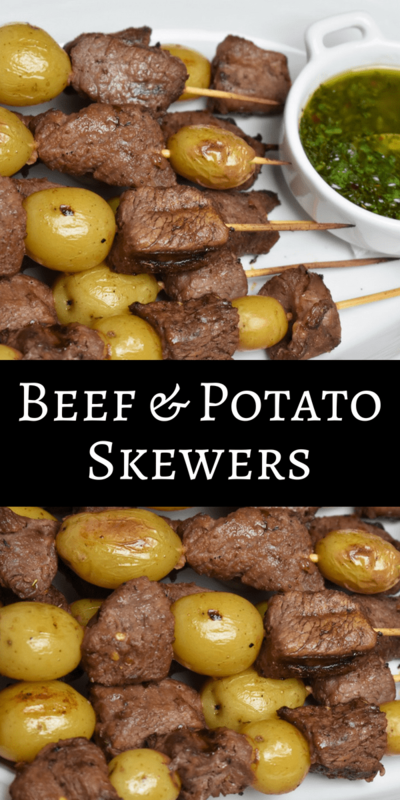 These beef & potato skewers are great for summer cook-outs. Place the bamboo skewers in a pan that’s large enough so they fit lying flat. Cover the skewers with water. Soak them for 30 minutes to an hour. 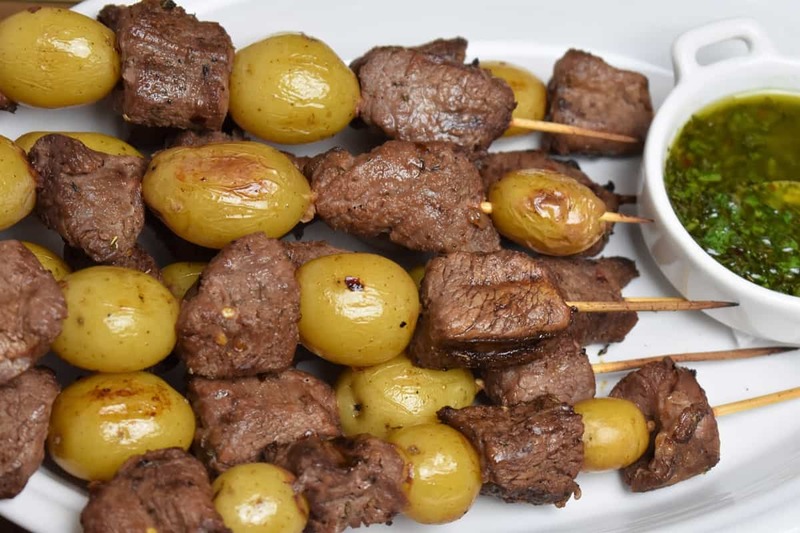 Serve the beef & potato skewers with the chimichurri sauce.